Teaching is a practice that demands life-long learning and an essential aspect of this journey is that I strive towards building and improving my own pedagogical content knowledge. I have to seek a deeper understanding of the content within an interdisciplinary context that is rooted in real-world issues and experiences. Essentially, my responsibility is to support learning that is engaging and relevant, and to do that, I need to know and understand the content AND how to best support learners to engage with it. Throughout this program, I’ve gained new skills and integrated new tools into my practice. I’ve added research, social media, online discussions, scholarly readings, and trying out new and emerging technologies to my practice, in a more intentional and productive way than I ever did throughout my career. My final products of learning in three courses during my Spring 2015 semester give a comprehensive picture of my mastery of this content knowledge goal. I coached teachers and supported their students in two MinecraftEdu experiences – Givercraft and Survivalcraft. These artifacts demonstrate my commitment to increasing knowledge, deepening understanding, and building skills even when I am already very familiar with content. I believe there is always more to know and that new perspectives from others give me new context to build my content knowledge. My SEACCR Research Paper is an artifact that demonstrates not only that I am knowledgeable about current academic content and standards, but that I also continue to develop and expand my knowledge and understanding of content within a broader context and its relevance to learners. This artifact documents an extensive and detail-oriented process of inquiry that I used to deepen and improve my practice and in how I designed and supported a virtual learning environment. I effectively applied a qualitative research approach, initially through my annotated bibliography and then more elaborately in my thematic review of the literature included in this artifact. The content being studied by students began in their English & Language Arts classes and became an interdisciplinary study throughout the MinecraftEdu learning experience. In examining common themes from the dialogue and discussion throughout the experience, I found that the social interactions, building tasks, exploration, and mobility in a virtual gameworld contributed to a collaborative community of learning between and among students and their peers as well as with their teachers. Students enjoyed an engaging experience discovering other communities, solving problems to survive and thrive, and translate their learning and understanding of the content into physical structures and meaningful role-play and interactions with other players. 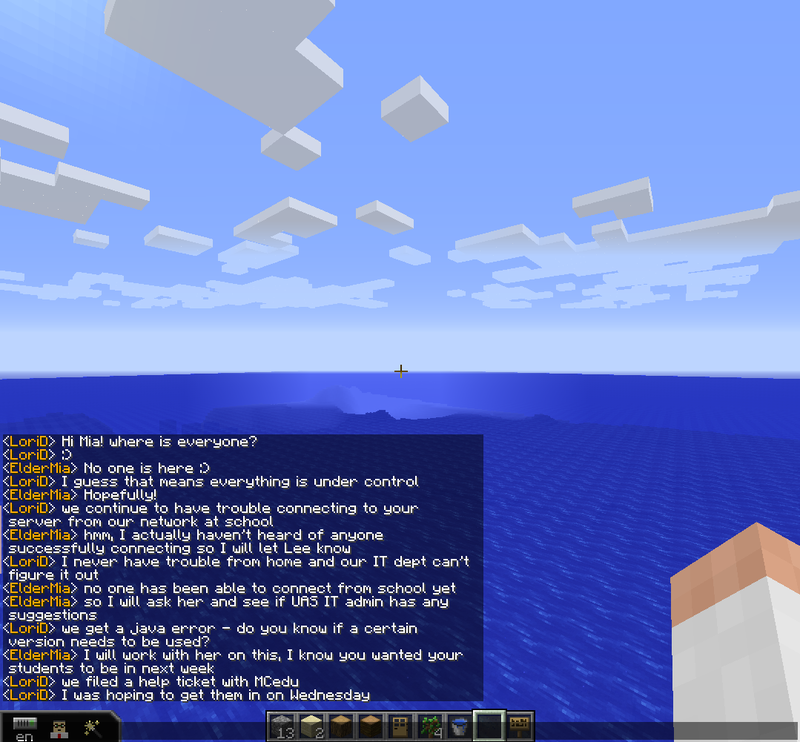 Throughout the artifact, I demonstrate my knowledge and understanding of the Minecraftedu game as a virtual learning environment, of the tools and skills needed to use the game, but more importantly, of the pedagogy and practice needed to support an interdisciplinary and real-world context for learning within the gameworld. I focused my research on teachers and their use of tools and strategies in managing behavior and moderating dialogue and interactions around the content being explored. My focus on teachers in this unique virtual learning environment contributes to a broader discourse in teaching about how to effectively integrate technology in learning, how to create meaningful and engaging learning experiences to explore content in a relevant and personal context, and how students can be supported to self-regulate and take ownership of their own learning experiences. Other artifacts related to this particular MinecraftEdu experience demonstrate how I effectively met and exceeded ISTE (NETS-C) Standards related to content knowledge. In my Diffi-Mooc internship reflection I outlined my role in supporting teachers to use technology tools and strategies within and outside of the MinecraftEdu gameworld to create a broader but more meaningful context for learning content. By modeling use of differentiation tools and strategies, game management and interactions with students, and by presenting and providing meaningful tasks, real-world context, and appropriate products of learning, I supported and mentored teachers to facilitate a highly-engaging experience for their students. An additional artifact relevant to the ISTE (NETS-C) Standards was my Philosophy of Online Teaching and Learning included in my OLTAK course Final Reflection paper. In my philosophy, I describe my efforts and experiences in expanding and deepening my knowledge and understanding of distance and online learning. Examining the Online Collaborative Learning Theory in addition to reflecting on my own experience as an online graduate student has given me greater context for learning and using technology for effective and meaningful learning experiences. The collaborative course design experience also meant that I was able to learn from my peers and the teachers that I was coaching through the online teacher training course. Using best practices and effective course design, I was able to effectively and appropriately support teachers and their students throughout the Givercraft and Survivalcraft experiences with MinecraftEdu.